The Food and Drug Administration approved a novel antidepressant late Tuesday for people with depression that does not respond to other treatments – the first in decades to work in a completely new way in the brain. The drug, a nasal spray called esketamine, has been eagerly anticipated by psychiatrists and patient groups as a powerful new tool to fight intractable depression. The spray acts within hours, rather than weeks or months as is typical for current antidepressants, and could offer a lifeline to about 5 million people in the United States with major depressive disorder who haven’t been helped by current treatments. That accounts for about 1 in 3 people with depression. 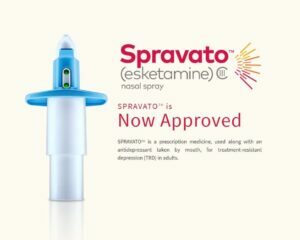 What is SPRAVATO (esketamine) Nasel Spray? SPRAVATOTM is a prescription medicine, used along with an antidepressant taken by mouth, for treatment-resistant depression (TRD) in adults.